The fashion warm TWD Daryl Dixon Zip up hoodie sweatershirt will make your witer more warm,a must-have for Daryl Dixon fan. If this item is defective upon receipt, customer has up to 8 days from date of receipt for exchange of a new one. If the product has no quality problem and theuyer wants a return due to size problem, please note that that shipping and handling fee is not refundable. Buyer is responsible for shipping costs incurred shipping products back. 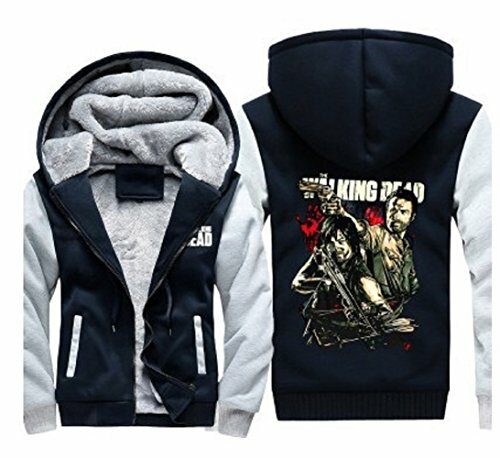 The Walking Dead TV Daryl Dixon hoodie sweatshirt Cosplay Sportswear Tracksuit. A must-have for Walking Dead fans. Before you choose the The Walking Dead Daryl Dixon hoodie swaetshirt,please refer to our size chart to choose the suitable size.